Product prices and availability are accurate as of 2019-04-11 13:04:21 EDT and are subject to change. Any price and availability information displayed on http://www.amazon.com/ at the time of purchase will apply to the purchase of this product. Made of Stainless Steel. 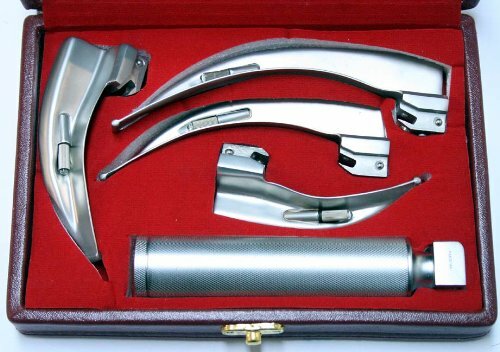 4 Blade Set + 1 Handle in a Case. Medium Handle. 4 Different Size Blades. Mac # 1 (Infant). Mac # 2 (Child). Mac # 3 (Med Adult). Mac # 4 (Large Adult). Blades are the Macintosh type these can be cleaned in an Autoclave Machine. Made By BDeals Excellent Quality. Brand New.